THE Bachelorette and her new beau have given adoring fans a look into their first romantic getaway together in Far North Queensland. Reality TV stars Ali Oetjen and Taite Radley touched down in Cairns at the weekend for their first public trip together. The pair dropped into Smithfield Coffee Club for a iced long black yesterday, before making their way to the Daintree Eco Lodge and Spa. 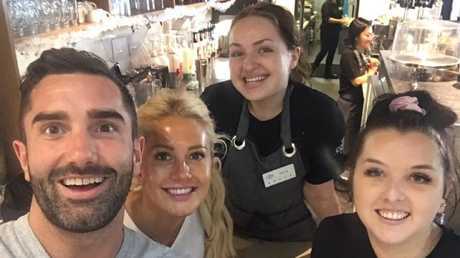 The Bachelorette stars Taite Radley and Ali Oetjen with Smithfield Coffee Club employees Skyla Rule and Shelby Symons take a photo on Sunday afternoon. They are now enjoying some downtime among the famous Daintree rainforest, with the 32-year-old blonde beauty taking to social media to share photos of their first day. "Love is something you become," she posted. Taite Radley and Ali Oetjen on their way to Daintree Ecolodge on Sunday. During their time in the Far North they also have scheduled a joy flight with Nautilus Aviation and will finish off their trip at The Ville Resort-Casino in Townsville. "North Queensland and the Daintree have been my favourite place in Australia since I was a kid. I'm a true nature lover and find it's the most enlightening, uplifting place to be, definitely my happy place. I can't wait to explore and share it with Taite," Ms Oetjen said.